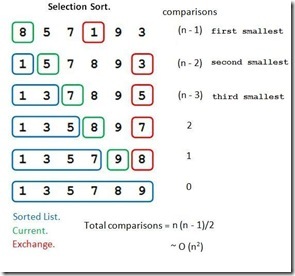 Selection Sort has a very simple algorithm; find the smallest and swap it with the first unsorted element. Rinse and repeat. Selection sort has a best, worst and average complexity of O(n2), as it has no early entry and always traverses the list (of n elements) n times. However it only performs n swaps, one for each element.